It was a beautiful summer morning when I pulled passed the Hunt’s Barn gate and started down the winding drive. 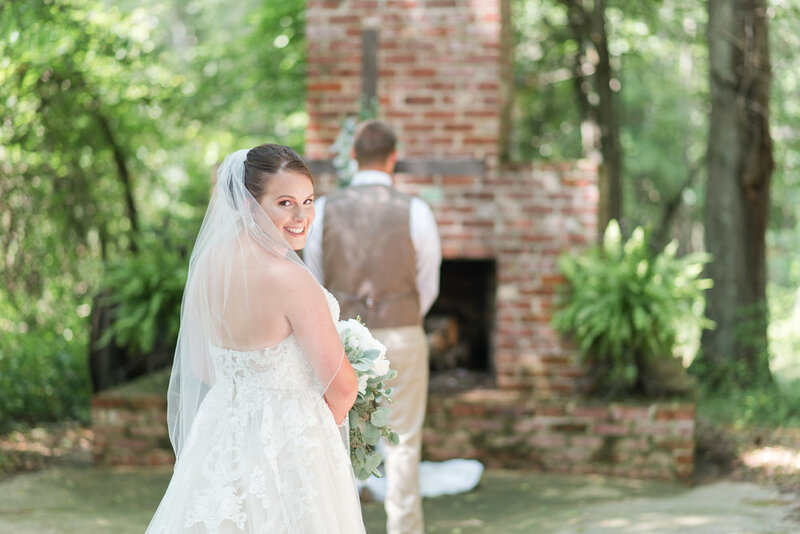 The oak trees lining the drive provided a beautiful canopy of filtered light leading to the southern style, brick home accented with curving walls and creamy white pillars supporting the front porch. 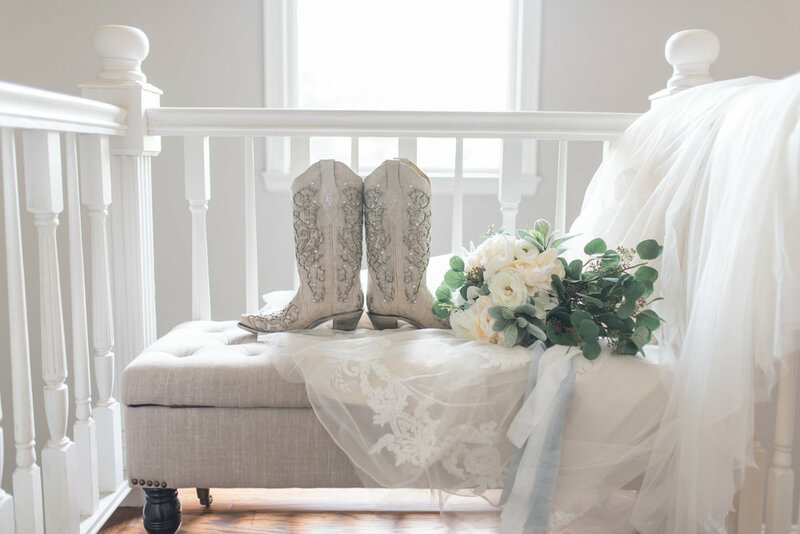 The Hunt’s Barn is a privately-owned home that opens up twice a month for weddings...and one entire side of the home is designated for the bridal party. When I went inside, it was decorated with vintage farmhouse furniture that Joanna Gaines would approve of—including a wall sized buffet and farmhouse dining table. Up the winding wooden staircase, Kayla and her bridesmaids were busy with hair and make-up. 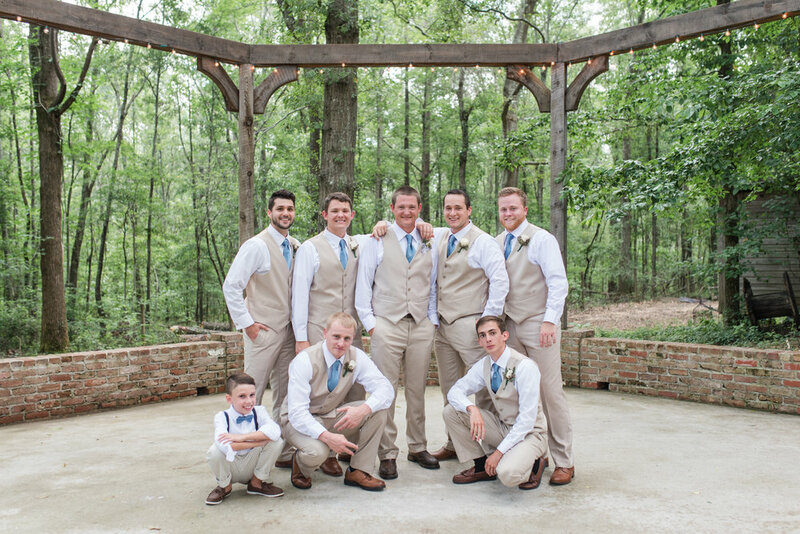 Kayla was definitely one of the most laid-back brides I’ve ever worked with! She knows what she likes, what she wants, but she conveys it with a sweetness that would never hint she was under any pressure or stress! Her gown was simply stunning—very airy, flowy and classic. 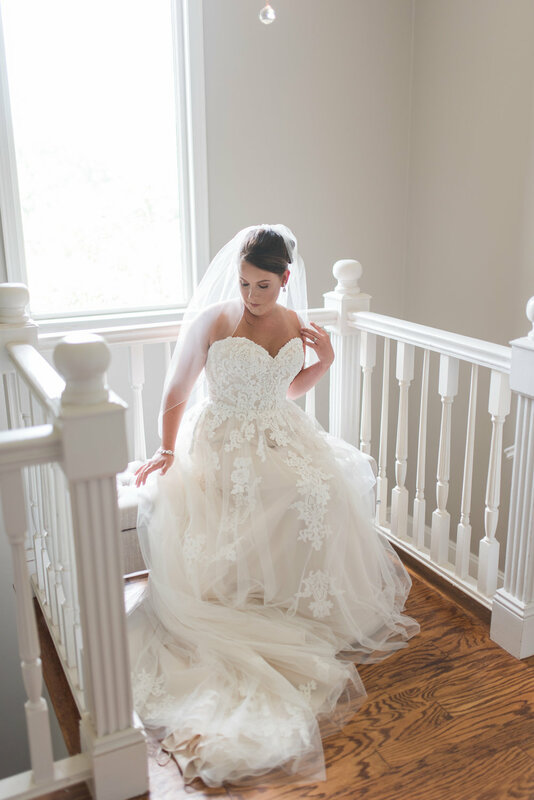 We hung it on the elegant chandelier in the dressing room to photograph it and ya’ll—it absolutely took my breath away! Kayla also had gifted her bridesmaids with the cutest set of pajamas—one-piece rompers adorned with pink and green flowers. 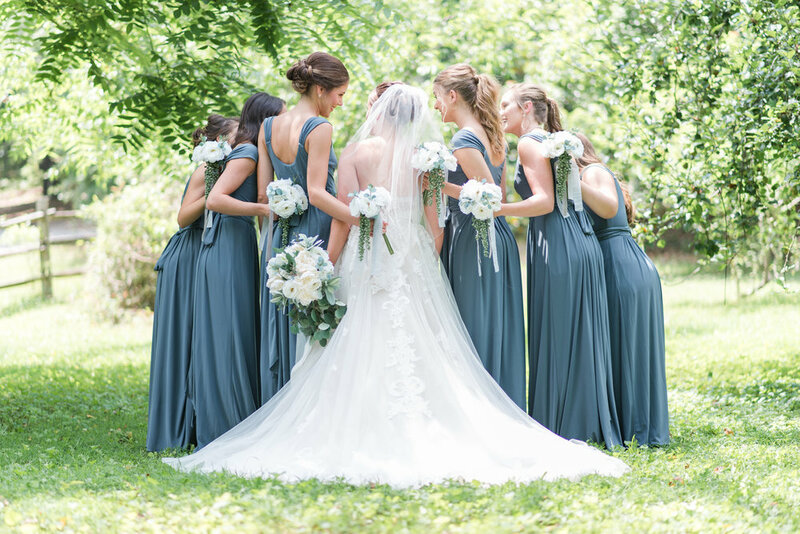 Most brides choose robes for their bridesmaids, and it was fun to see something different, original and it really made Kayla’s photos stand out! Kristal and I had fun hanging out with the guys down in the woods for their photos—even when we were missing a boutonniere Kayla didn’t panic.She calmly told me what she wanted done, and that was that! I was really amazed at her poise. 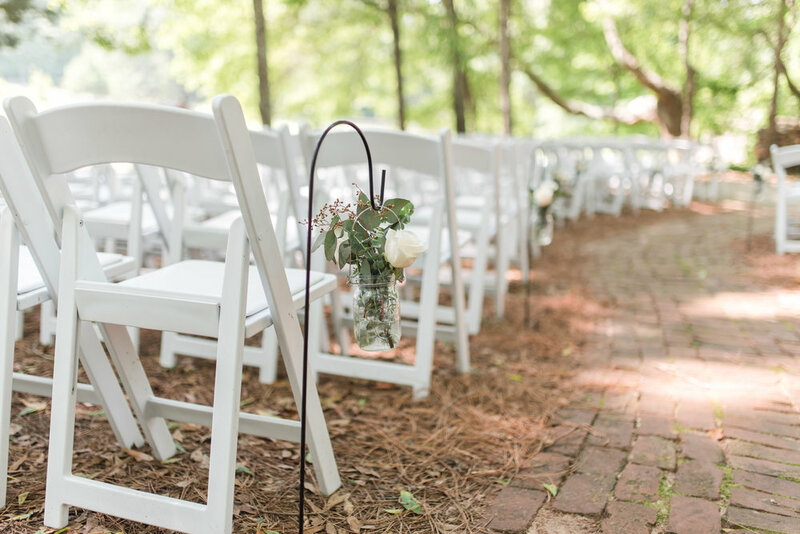 The ceremony setting was through the woods and down a brick path. 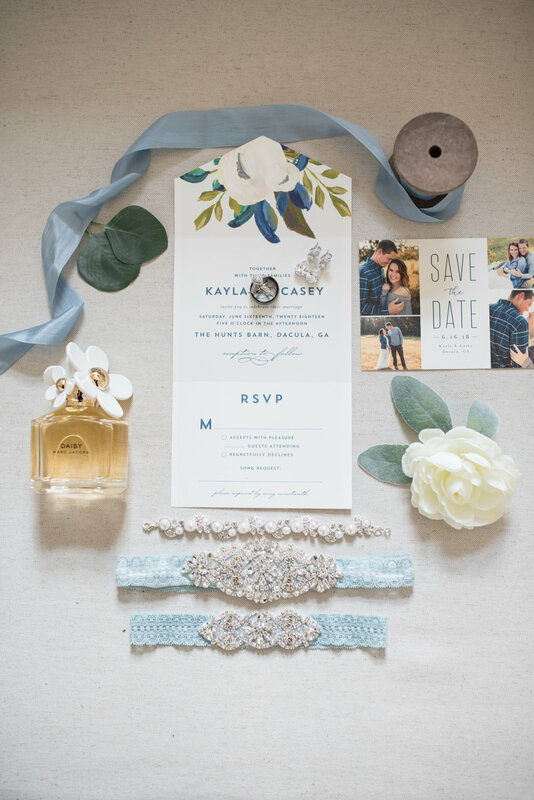 Kayla chose that for her first look with Casey because she wanted it to reflect her coming down the aisle. When Casey finally turned to see his beautiful bride, his face lit up and his hands instantly covered his mouth in surprise and awe—it was definitely one of the most memorable first looks I had photographed. 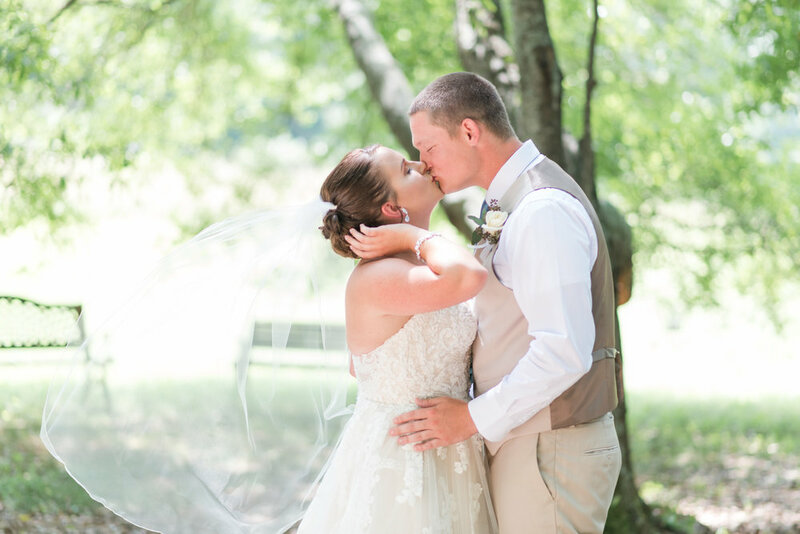 We shot some bride and groom photos after the first look but saved the rest for after the ceremony. The ceremony/reception area reminded me of an enchanted forest. 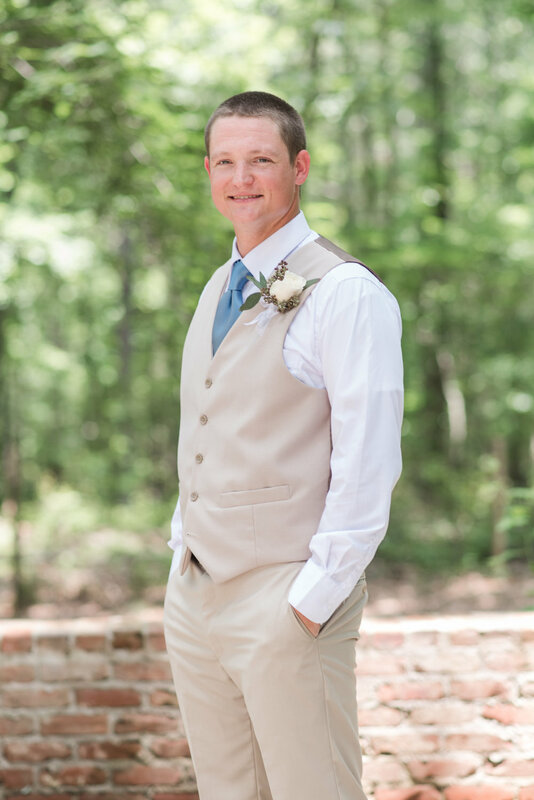 The reception site was a barn open on both sides with gorgeous rustic chandleries hanging down the center and accented by a draped white cloth. 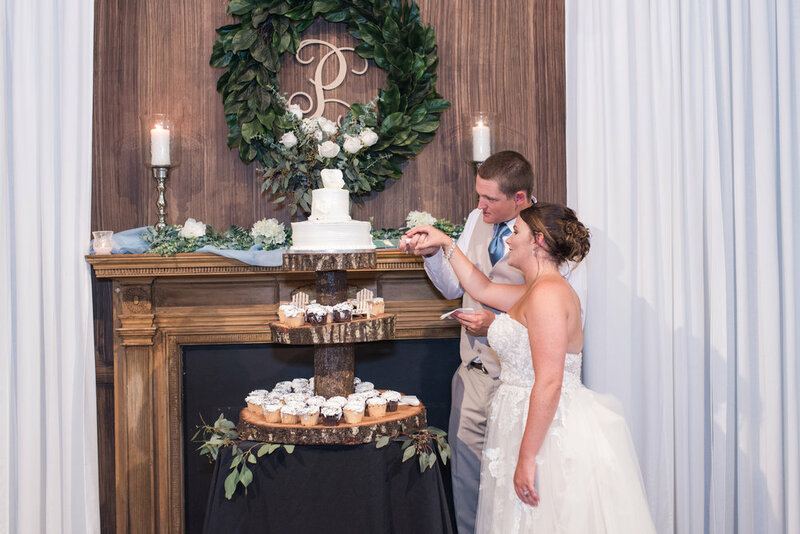 The ceremony centerpiece was a brick fireplace with a chandelier. 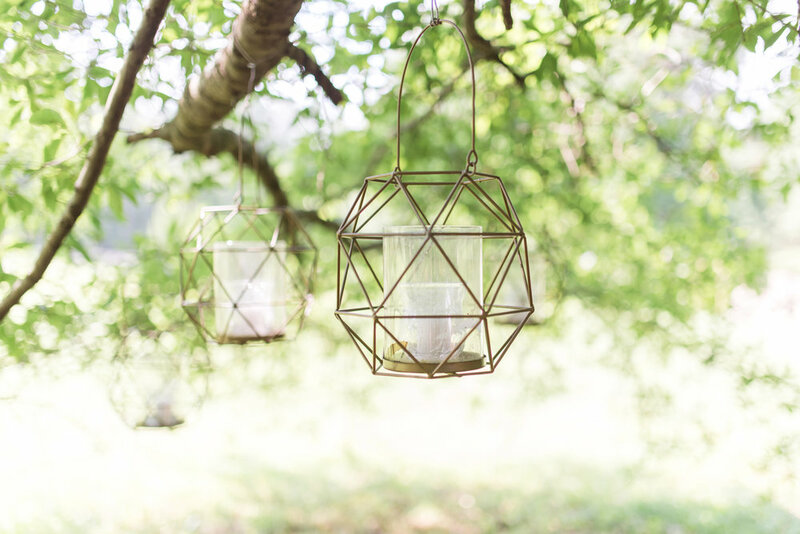 Everything was nestled in the woods, and when surrounded by the quiet forest and filtered sunlight, there was just one word for it: Enchanting. 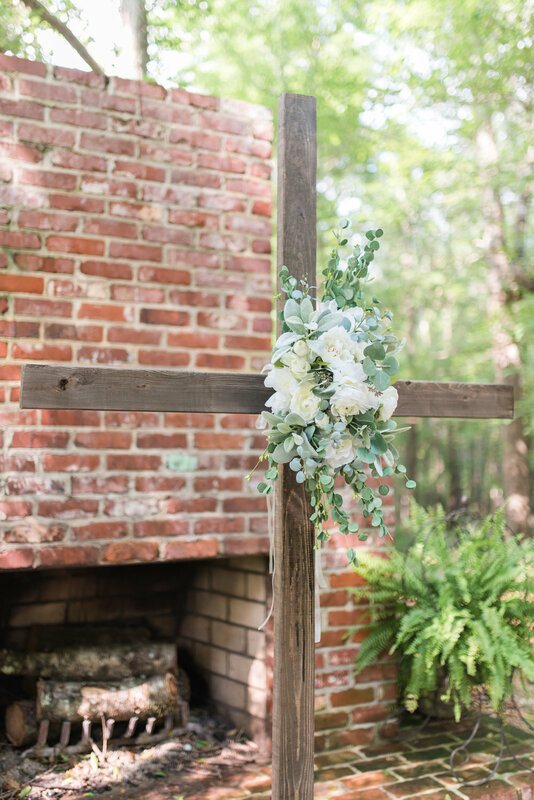 The ceremony was God-centered and sweet—Kayla and Casey read their own vows to one another and completed a cross sculpture. 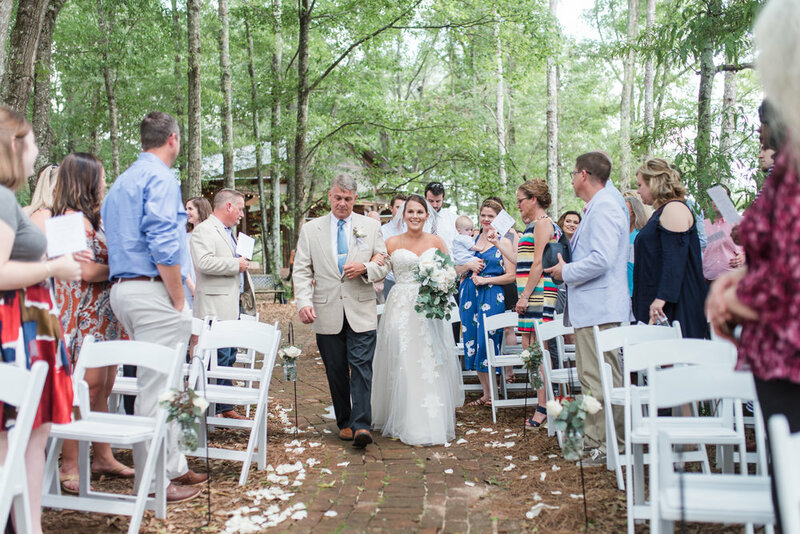 It was June, and it was hot—and when at last everyone was introduced at the reception, Kayla’s father made everyone laugh when he pulled her over to dance directly in front of the fan. Although thunder rumbled in the distance, the rain held off long enough for the guests to dance in the open pavilion and really enjoy the beautiful celebration. I really enjoyed getting to know Kayla throughout the planning process...she was becoming a coach’s wife (just like me!) and I learned that she monogrammed...so I’m excited to reach out to her in the future to help me with some projects! I was so honored to be able to photograph Casey and Kayla’s beautiful day—congratulations to you both, and may God continue to bless you throughout your lives!